I have had the pleasure of hunting with JJ AKC name, (Rockin Joan Jet} for the past three years. for diving cripples. We have hunted with her in some horrible weather. A hardier dog you will not find. Any one getting one of her pups will have an awesome dog even if it’s only half as good as her. JJ, also known as “Missy Meister Nobody Nicer”, “J-Meister”, “Mustang Sally”, “The Hunting Machine”, “Goose Dog” and other pet names. She is the RiversEdge bred daughter of our GCH Echo Bay’s Trinity at RiversEdge, RN, JH, our fabulous,”T”, and sire, CH Rippling Water’s Purple Haze, MH. 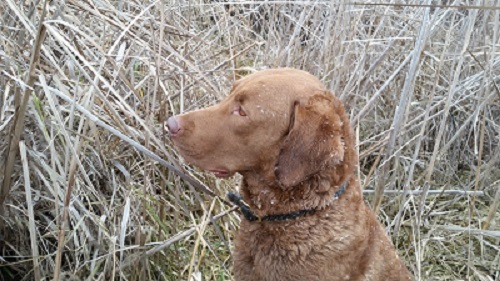 She has beautiful confirmation, lovely temperament and outstanding hunt retriever instinct, and skills. RiversEdge Rockin’ Joan Jet RN, JH x BISS GCH CH Longmeadow Think Differently (Dyson) litter born 11/18/18. Another excellent match with 10 beautiful pups, sure to be outstanding in temperament, conformation and performance. (Reservations full at this time). JJ delivered 10 beautiful and healthy pups February 27, 2016. 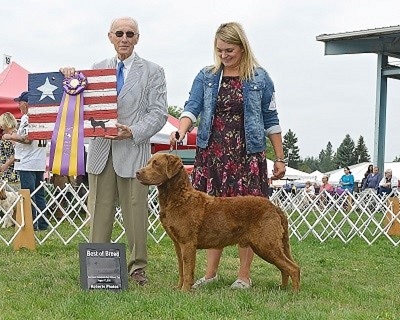 Sire was GCH CH Desert Winds Unintended Consequences, CDX, SH, WDQ, “Ruckus” who is a perfect match for excellent temperament, conformation, and performance attributes and accomplishments. this was an outstanding litter with amazing potential and titles to show for it. JJ is AKC conformation pointed with 10 points and a Major win. In 2016 she earned 2 more AKC points toward her Championship. In 2015 She earned her Rally Novice title, and 8/15 conformation points. 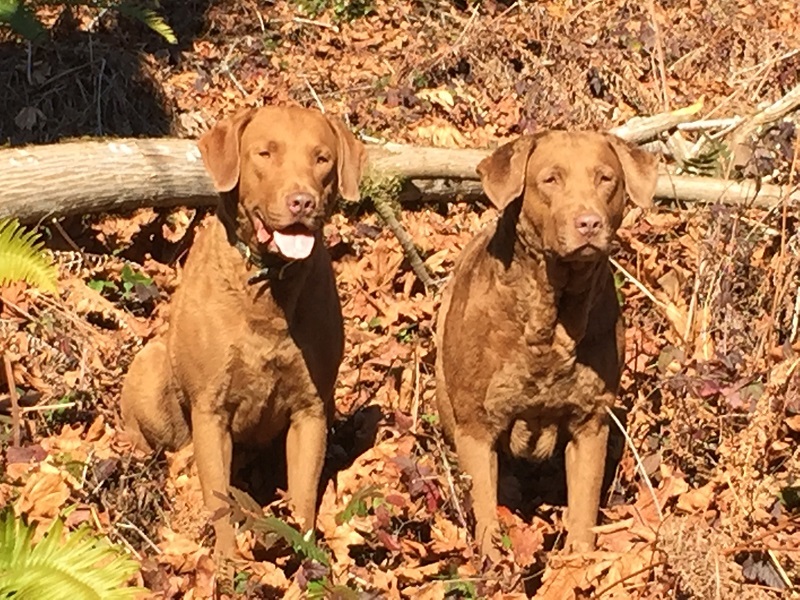 She earned her Started Hunting Retriever (SHR) title June 2, 2013 and her Junior Hunter (JH) title in Sept. 2013. 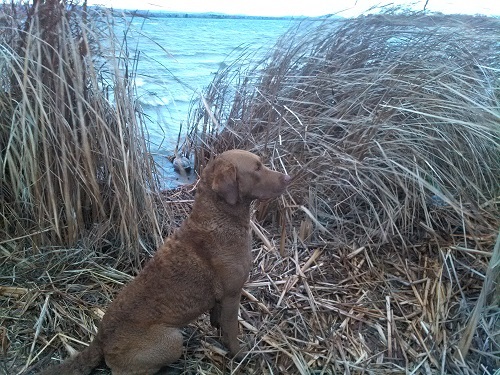 She has proven to be the most outstanding RiversEdge hunter, retrieving countless geese, ducks, and pheasants. Her claim to fame is retrieving 2 geese without them being shot. She annually retrieves our Thanksgiving and Christmas game birds.